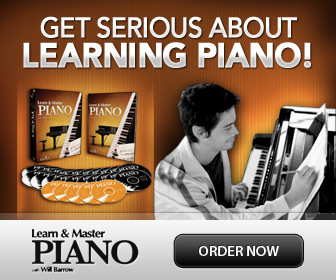 Learn solid piano playing tips and exercises to help you become great at balancing the weight between the hands, and to be able to bring out the melody above the accompaniment! A common difficulty for pianists is how to make the melody sound more than the accompaniment. But some pieces bring some challenge to the matter by having a rather difficult accompaniment in the left hand, which then makes us focus more on the «difficult» hand. Another problem is when it is reversed, the melody is now in the left hand, and the right hand needs to get soft. Arrgh! Here are three useful piano playing tips and exercises that really work. Learn them all so that you can always be able to bring out the melody- wherever it is hidden! How to bring out the melody in either the right or the left hand. Play. Listen. Observe. There is no right or wrong yet. OK. How much did you think your weight was? Let’s say you thought 3. Now play as loud as you can. This is 5. Play the softest you can, really, really soft... this is 1. Play again whatever loudness and just observe again. Compare the two hands. The right hand, how heavy is it? 1-5? The left? There is no right or wrong! Just observe, neutrally. Let’s say that you felt your right hand was a 4 and your left was a 3. Now, as you keep playing both hands, focus on bringing your right hand to 5. Never mind what the left does, just focus on the right. Then bring it down to 1. This time do the same with your left. Bring it to 5, then 1. Now, depending on the piece you play, and what hand needs to be loudest, you focus on bringing each hand to the level you want. Let’s say 5-3. Keep working on the extremes- sometimes even 5-0. This means one hand just touching the keys without sound! It's all about learning to feel balance. Bring out the melody in one hand while playing the accompaniment or a part of it in the same hand. See how the top notes are "hiding" the melody? The melody notes have a stem going up, indicating that they are quarter notes and showing us that here's a melody hidden. The problem: The melody is played with the fingers 3,4,5 all the time. The other fingers should be played softer so the melody can be heard. Add the other notes, but while holding the melody note as long as possible, you will play the others staccato! Keep practicing until you can play the melody notes long and legato and the other notes staccato. Add your left hand, then the pedal... That’s it! Keep practicing with a good etude book. I recommend Piano Etudes by Francis Clark for adult beginners. Put one hand on «auto-pilot»! Here is a true multitasking exercise, and great fun to do! Let’s say you are working on S. Joplin’s "The Entertainer" (Click for a free PDF). Problem: As you can see, there is some hard work in the left hand, and then on top of that - all the stuff you need to do with your right. Whew! Learn the left hand of one section really, really well. You should be able to play even with your eyes closed- and not miss any of the jumps! But play slowly in a comfortable tempo. Keep on playing, the same and the same. Watch the TV (Hah!) Keep on playing! Polish my piano (Ha!) with the right hand. Read aloud from a book. Put a pencil here and there on the keyboard with the right hand. All while playing the same pattern over and over in the left hand. What are Your Best Piano Practice Tips? Found a great way to practice? Share your favorite piano practice tips, or a practice routine that works best for you!